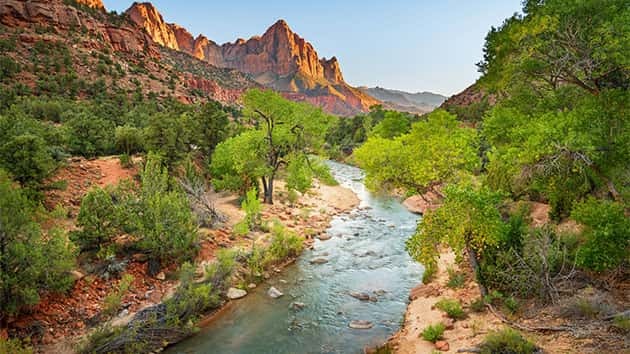 A 34 years old man has been reportedly rescued after his leg sunk down to his knee in quicksand during a hike at Zion National Park in Utah on Saturday. As per park officials, the man was hiking in the Left Fork of the North Creek when he became stuck and was unable to free himself. He has not been identified by the officials. At the time of hiking, he was not alone. His female hiking companion was also with him. But their efforts to free him were fruitless. The woman decided to leave for getting help and before that she gave the man extra clothes to keep warm. As per park officials, temperatures on the trail were frigid and reached the low teens. The female companion trekked for three hours in order to gain cell phone service and call emergency authorities, according to park officials. When she was located, the park officials first treated her for hypothermia. After several hours, the man was located, and he also had a sign of hypothermia, exposure, and injuries to his extremities, park officials said. It again took more hours to free him from the quicksand. The park rangers spent the night with the man because he was in no condition to hike out. Staying there they began to rewarm him and treat his leg as four inches of snow fell overnight, park officials said. On Sunday morning, Feb. 17, a Utah Department of Public Safety helicopter was flown from Salt Lake City, Utah, to pick the man up. However, the park officials said, winter storms in the area caused low visibility, delaying the helicopter’s rescue. As per park officials, the DPS helicopter was able to safely get the man out of the park after a small break in the weather occurred in the afternoon. He was then moved to a hospital by ambulance. Aly Baltus, the spokeswoman for Zion National Park, said quicksand is not normally a problem in the park. However, she added the weather at the time was a contributing factor to its formation.